Our comprehensive Python Detector User Manual covers all the detail you need to know about the Product, the Installation, Using your Python, Hints and Tips and other useful information. 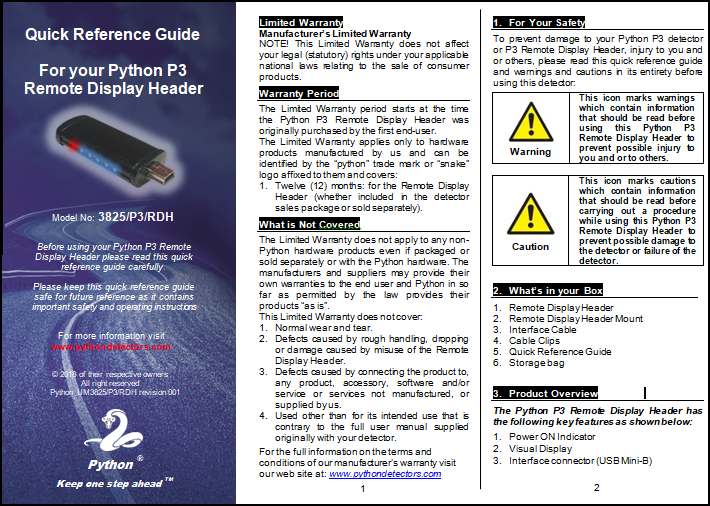 Please find an early release version of our New Python P3 Detector User Manual. Our new Python P3 Detector includes a new user turning mode for improved detection sensitivity, enhanced user display and additional user alert functionality and includes our built-in power booster. Our Python P3 Detector will also supports connectivity to our optional Remote Display Header via the detectors expansion port. The Remote Display Header allows you to mount our small Visual Display in a different location than the main Python Detector Unit. 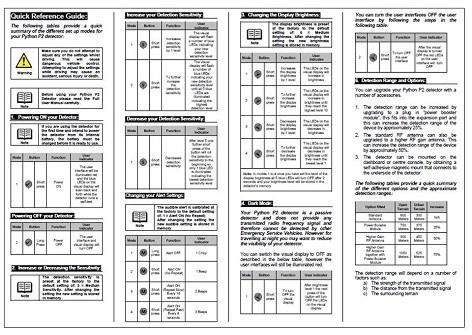 Our Python Detectors Quick Reference Guides provide a quick summary of the different set up modes for the different Python detectors. Please Note: Before using your Python Detectors please read the Full User Manual carefully. Our Python Remote Display Header that allows you to mount our small Visual Display in a different location than the main Python Detector Unit. This allows the main detector unit to be mounted more discreetly e.g. in the glove box or under a seat. The detector must be used with the high gain windscreen antenna or external antenna for best detection. Our Python P2 Power Module Detectors Quick Reference Guides provide a quick summary of the installation and set up modes for the Power Booster Module. Please Note: The Power Booster Module is only compatible with Python: Model No. 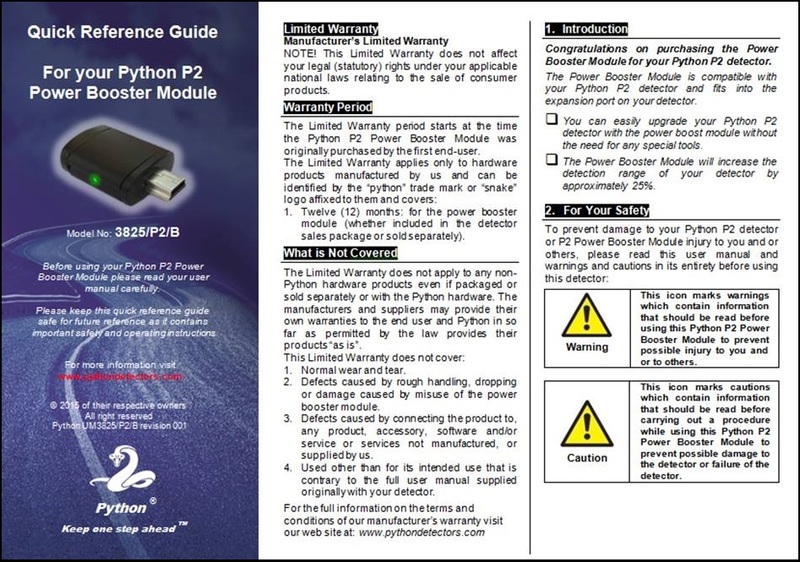 3825/P2, before using your Python P2 Power Booster Module please read the Full User Manual carefully. Our Python Hardwire 12V DC Charging Lead Installation Guide provides the key steps for installation in your vehicle. 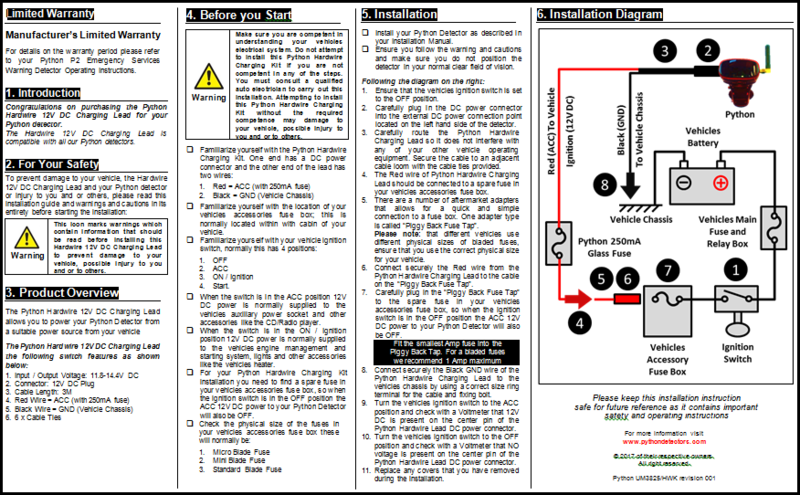 Please Note: Make sure you are competent in understanding your vehicles electrical system. Do not attempt to install this Python Hardwire Charging Kit if you are not competent in any of the steps. You must consult a qualified auto electrician to carry out this installation.